While the calendar isn’t quite past the Vernal Equinox, the moderate temperatures and increased wildlife activity surely signify that Spring is coming soon. I’ve noticed a significant amount of wildlife the other day on my drive home: sandhill cranes, several groups of turkeys, 3 herds of deer with 20+ in each group, counted 5 Red-Tailed Hawks and two nests, many flocks of Canada Geese, ducks, songbirds, and even a Red-Winged Blackbird. All the animals are showing more activity, even the rabbits in the swamp in my back yard. So with spring around the corner, the end of the first hawking season is very near. While Tahoe did not target fox squirrels this season, she did take a swipe at a few and even chased one around a tree trunk one afternoon. Squirrel Hunting season officially ended on February 28th of this year. So they are done. Rabbit season finishes up at the end of this month. However, the end of Tahoe’s flights may end sooner, if the weather gets warmer and Tahoe gets more distracted in the field by the call of the wild. 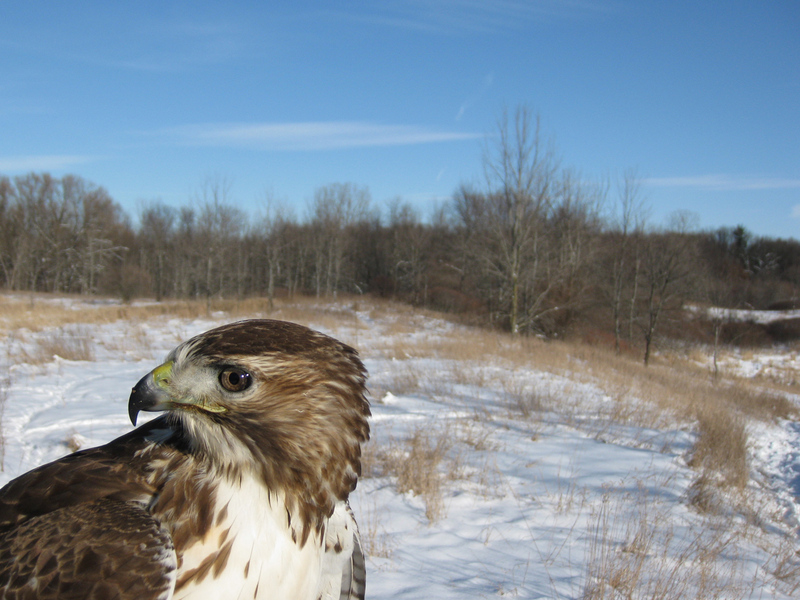 Hawks tend to take to spring thermals very quickly, and then end up in a soar for the afternoon, leaving the falconer driving around a while with the radio-telemetry going. Sometimes it’s best to call the end of the season early, especially when the weather turns unseasonably warmer. So now what? What do you do with a Red-Tailed Hawk until Rabbit season starts again in the Fall? Warmer weather and a surplus of food make it great for hawks to molt and rear their own brood. Tahoe won’t be mating this year being cooped up in the mews, but she will molt her feathers and turn her plumage into the adult feathers, complete with red-tail that these raptors are famous for. Looks like we’ll get to witness a wonderful transformation, up-close and personal with Tahoe over the summer months. The joy of falconry has taught me much about predator-prey relationships, bonding with raptors, and the truly wonderful world of hawking for rabbits. I have a well-mannered hawk in my mews that I truly enjoy taking care of, hunting, and watching. While the partnership will have to remain within the confines of the mews, backyard, and house for the summer, I sure am looking forward to a break from the hunting excursions for some warm weather activities and fun with the family. Head Count or Outdoor Adventures? The hunting season for eastern cottontail rabbits is coming to an end soon, and so will hunting together outdoors with Tahoe. I’ll get to experience the molt for the summer and watch my raptor transform her feathers into the beautiful adult plumage that red-tails are famous for. I was chatting with a friend of mine about my hunting adventures and my success rate as a first time apprentice with a first year bird. Our conversation turned to head count and various ways of measuring success. Head count is one way of measuring success if you are into keeping score. 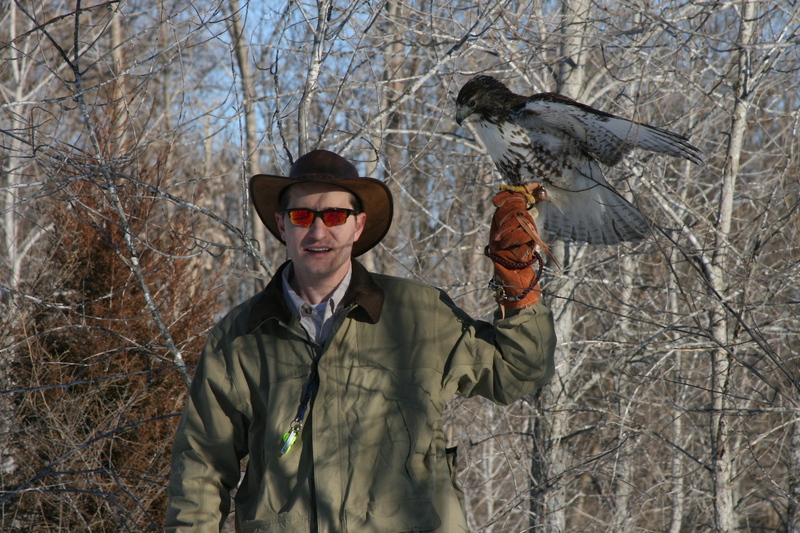 There are also various levels upon which to achieve success and be excited about hunting and raptor performance. Did your bird end up back on your fist at the end of the hunt? If so, you should count your lucky stars and call it a good day. Does she follow you across the field and position herself in a tree in anticipation of flushing game? If your bird caught two mice and missed one rabbit, is that a good day? Or do you lament the fact that your bird missed the ‘big prize’? 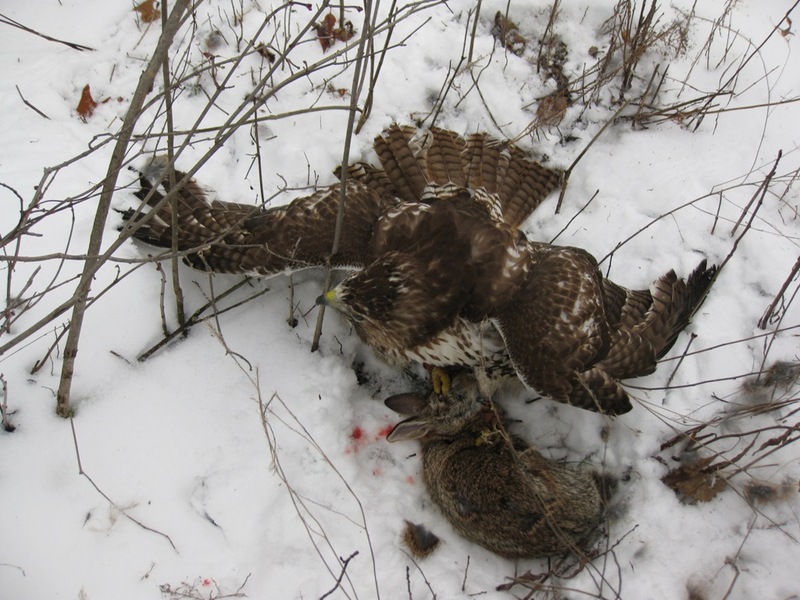 Game is game, and I’m pretty sure that the hawk enjoys catching her own snack out in the woods on a hunt, regardless of it being a mouse, vole, squirrel, or rabbit. People who tend to find themselves on the opposing viewpoint of hunting and outdoor adventures usually don’t understand why people persue outdoor recreational activities. People don’t go fishing to catch fish. If sportsmen were in it only for filling their creel pouches, they’d call it ‘catching’ instead of fishing. 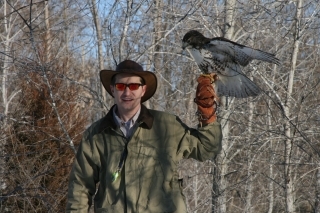 Going out Hunting and practicing Falconry with Tahoe are ways to get closer to witnessing the natural predator-prey relationship in nature and experiencing the outdoors. I don’t do it for the sole purpose of killing rabbits or catching as many squirrels as I can chase around the woods. It’s about the being in the outdoors and enjoying the fresh air, the wind, the sunlight, the trees, the forest, and all the little things that nature has to offer that you can’t see any other way. 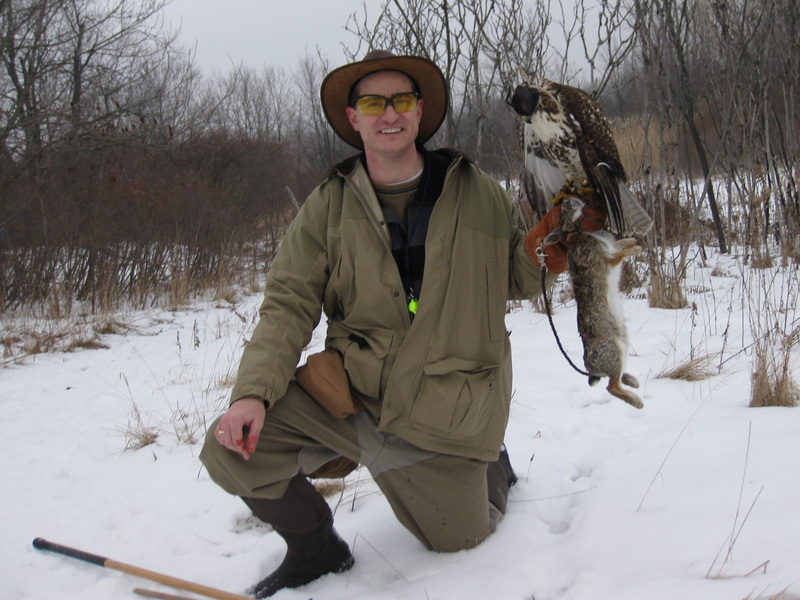 So with the hunting adventures for this season winding down, I’m certainly not looking forward to hanging up the wetland boots and falconer’s gauntlet until next October. As a first year apprentice, I *am* thankful that I have learned invaluable knowledge in my first year, and have a good game hawk that can only improve as the years continue to keep us together. 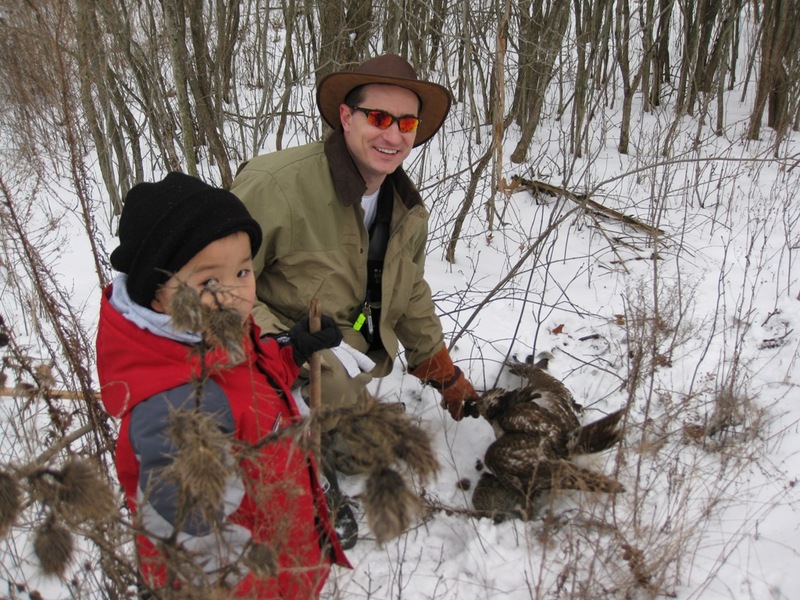 I have also enjoyed many walks through the wilderness this winter, even if it is just a few miles from the house and I have a fantastic hunting partner who flies through the trees while I walk in the woods. What do you think? Please leave your comments! The mid-January thaw is always a great time to get outdoors. If you love to ski or sled or toboggan, or just get out, the (relatively) warmer temperatures always make it easier to enjoy the snow. The animals also notice the change in the weather and they become a little more active. So I like to take advantage of these days as a hunter and get out into the field to chase after rabbits. Of course, Tahoe loves to fly for them too. So with the nice(r) weather during this weekend, I wanted to get out and hike through the woods, beating the brush for bunnies. Marius came with today to get outside and get some fresh air. Besides, what kid doesn’t like to get outside after being INside for a while? We started out at one of our usual spots, and Tahoe flew through a series of regular perches. She follows along quite well now, and really starts paying attention when the brush starts shaking. I began walking through the ‘tough’ stuff, and I mean viney, picky, thorny-briar patch stuff. The kind of stuff that would wrap around your ankles, trip you up, and tear you to shreds on your fall down. It was a great area because the rabbit-sign (evidence of rabbits) was abundant and fresh, so I couldn’t NOT walk through this swail. After I had checked as many places as I could, I wandered off to the left to check out another patch, and Tahoe took a second high perch. I turned around just in time to see her dive out of the tree, and hit the ground hard. I heard her crunch through the thorny underbrush, and I was concerned about her feathers and feet. When I heard the rabbit cry, I knew she had hit her mark. I ran over to her and peeled back the brush to give her some room to move. 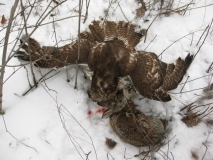 She had a nice head-hold with both talons, and the rabbit was quickly immobilized. I traded her off the rabbit to the lure and dispatched the rabbit properly. After giving Tahoe a few minutes to ‘reset’, we continued our hunt around the park area and finished up without seeing another rabbit. It was a good hunt! * I should also note here that photo credits go to Marius! He took the photo above! It’s been almost two months of hunting, waiting for a good amount of snow to cover the ground. A good snow makes it easier to track rabbits and squirrels out in the woods. It lets you know if they are around, where they hide out, and how active they are. What’s more, is that when you move one in the woods, you can track them down easier through the snow after they flush. Unless of course if the tracks lead you to a hole, in that case you are out of luck. I’ve walked through a few of my hunting spots in the past week that looked good earlier in the fall. Earlier fall hunting turned out to be fruitless, but I was certain that there were rabbits inhabiting my favorite areas. My suspicions were confirmed that they are good rabbit areas by hunting in the snow and being able to see the activity left behind by the residents. Tracks, sign, and droppings were plentiful at my top sites. So, as I trekked around the woods for the past two days, I watched closely for the signs, tracks, and other clues as to where rabbits and forest critters spent their time. The snow also helps pick out movement, as brown / black bulky figures really pop out against a white background. Tahoe easily saw a squirrel bolt down a tree towards the snow, and then she barreled after it. The squirrel survived after dashing under a log and then disappearing down a trunk, or a hole, or some hideaway that I could not see. I did my best to track it through the snow, but the signs eluded me on this little guy. It was a good chase for a minute, and Tahoe seemed excited about it after she took a high perch. She may have been disappointed, but it wasn’t obvious, as she followed right along to the next tree and we walked deeper into the forest. The remainder of the hike left my game bag empty and my legs tired from clomping through the deep snow. The sunshine made it a bearable afternoon, although the wind picked up and chilled the cheeks a little bit. It took three months from trapping her, but Tahoe was finally successful out in the field today. She caught her first rabbit and made her first wild kill as a falconry bird! Marius came along today for a nice walk in the snow, as well as Sue. We were walking a short brush-line with some trees, and Tahoe was following along well. She stayed overhead, and didn’t stay much more than 25 yards behind before moving to a new perch. I was very happy with her following ability today. About 15 minutes into hunt, Tahoe launched herself from her high perch and flew past me and took a slicing flight through some brush and nailed her target. I quickly caught up to her landing site, and helped her with the rabbit. With this being her first kill, the interaction had to be positive. She did not bristle, and she did not give me any trouble with the trade off. It was a good learning experience for both of us. We walked through another section of the hunting ground for another 45 minutes in the hope of scaring up another bunny. We chased one through another section of brush, and Tahoe saw it and took a short flight before checking off and finding a high perch. I was not able to flush that bunny again, but Tahoe was flying well and the day was a good hunt.